This great recipe is adapted from Lynne Rossetto Kasper and Sally Swift's excellent book called The Splendid Table's How to Eat Supper. 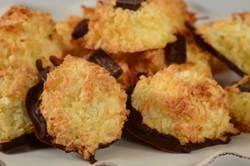 It is quite a bit different from the other Coconut Macaroon recipe I have on the site. First, instead of using just egg whites, this macaroon uses the whole egg. And no flour is added, they are made simply by mixing together eggs, sugar, vanilla extract, and dried coconut. You can use either sweetened or unsweetened dried coconut, shredded or flaked. Sweetened dried coconut is coconut that has been dried and then mixed with powdered sugar. If you like your Coconut Macaroons quite sweet and chewy, then use this type of coconut. But if you prefer, you can use unsweetened dried coconut as this type of coconut is just coconut that has been dried and has no sugar added. But I find that the amount of sugar you need has to be increased from 1/2 cup (100 grams) to about 1 cup (200 grams). The other two things that make this recipe so different is that the eggs do not have to be warmed and there is no chilling of the batter. Once the cookies are formed into small mounds, that look like haystacks, they are baked until nicely browned. Now, if you are like me, and think there is nothing better than coconut and chocolate, you won't be able to resist placing a small chocolate chunk (semi sweet or bittersweet) into the center of each macaroon before baking. Or maybe you would prefer dipping the bottoms of the baked and cooled cookies in melted chocolate. The day these cookies are made the outside of the cookies will be quite crisp while the inside is soft and chewy. However, after storing, the outside of the cookies will soften as will their flavor. Personally, I like them both ways.